Below are links to the verbatim language that Trump signed, a brief look at what’s coming next, and what you can do to stop the pipeline, including tweeting the President and weighing in on the current DAPL environmental impact statement. The President’s executive memorandum on DAPL directs the Army Corps of Engineers to take “all actions necessary and appropriate … to review and approve in an expedited manner,” whatever is needed to construct and operate DAPL. [I]t is the policy of the executive branch to streamline and expedite, in a manner consistent with law, environmental reviews and approvals for all infrastructure projects, especially projects that are a high priority for the Nation, such as improving the U.S. electric grid and telecommunications systems and repairing and upgrading critical port facilities, airports, pipelines, bridges, and highways. The actions permitted in both the DAPL memorandum and the executive order still have to follow existing law. Expect litigation efforts to slow, if not stop, the project. For instance, during the last months of the Obama Administration, the U.S. Army Corps of Engineers denied an easement to DAPL developers to drill under the Missouri River. The Corps began an environmental review process. That could provide a significant legal lever to slow the project. Tribal attorney Jan Hasselman said what happens next will depend on how the Corps interprets the language. He said the tribe will fight in court any reversal of the Corps’ recent decision to conduct a full environmental study of the crossing — a process that could take up to two years. Not completing a study “would be a gross violation of the tribe’s treaty rights,” he said. We blogged Jan. 22 that the Standing Rock Nation had voted to close the camps that sprang up to stop the pipeline. However, it is unlikely that all protestors will leave. If DAPL developers start drilling, there is a very strong likelihood of more violent clashes. 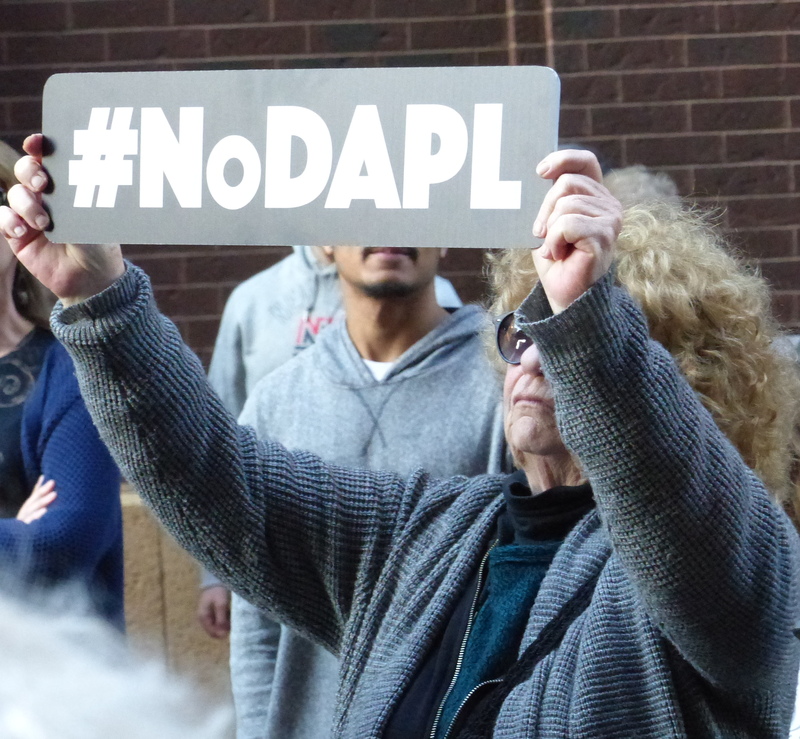 Soon after Trump’s DAPL announcement, groups began sending action alerts. Here are a few. They have reopened their petition opposing DAPL. (It now has more than 460,000 signatures!) If you haven’t signed, please sign. If you have signed, please share it with your community. Click here to tweet it out, or click here to share it on Facebook. Please make a comment to the U.S. Army Corps of Engineers. The Environmental Impact Statement is still in process, and the Department of the Army’s Civil Works division will be accepting public comments until February 20th. To affirm our claim that the pipeline poses grave environmental risks, please submit a comment here: http://bit.ly/2jZttfo. Show President Trump that we will continue to fight these pipelines every step of the way. Send him a Tweet now; then send a message directly to the White House. Honor the Earth: Follow Honor the Earth. It has not issued a specific action yet, but it has a campaign against pipelines and is an important voice on this issue. Now is the time to be in action: persist and resist!